A recent report issued by the Institute for Supply Management documents that the U.S. manufacturing sector has expanded over the past 11 months. 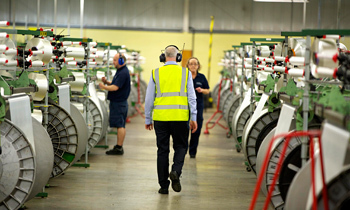 Comments from panel members reflect significant growth through the first four months of 2014, providing evidence of meaningful strength in manufacturing – an economic sector once written off as dead. But, will 2014 be a good year for California manufacturers? Although it is too early to tell with certainty, many experts are seeing increased demand for U.S.-based products across country, including the State of California. Even though making specific recommendations for an individual organization based on general manufacturing trends is very difficult, examining the latest trends can help manufacturers operating in California succeed in today’s global market. Here are the top three trends we have identified as being the most valuable and relevant for California manufacturers. Re-shoring – Re-shoring more operations back to the U.S. will help us increase exports, reduce imports and regain manufacturing jobs. Additional reasons to re-shore include superior quality and inventory control, minimized logistics costs, improved ability to respond to market demands and consolidated defense industrial base, which plays a significant role in strengthening the U.S. economy. In an effort to encourage re-shoring and sustain growth across the manufacturing sector, the State of California offers a series of incentives, including “California Competes” program, which provides 180 million in tax credit for businesses that want to relocate or expand to California; worker compensation reforms, which allow for reduced costs to businesses and increased payments to workers; and tax exemptions for certain industry sectors (e.g. furniture, machinery, fabricated metals, appliances and computers) to encourage investment and job creation. Manufacturing Skills Gap – With the manufacturing sector expected to suffer large numbers of retirements over the next 10-15 years, it is believed that a skilled worker shortage will become a very serious challenge that needs to be addressed as soon as possible. The solution? According to industry experts, California manufacturers must find a way to change people’s perception of manufacturing. Although this sector has evolved over the years, wrong perception relating to rigid jobs, hard work and short breaks keeps new generations away from factories. Fueling this perception problem is a lack of investment into programs designed to develop the next generation of manufacturing employees. Many manufacturers have made considerable investments into technology. However, most of them do nothing when it comes to bringing in fresh talent. One solution is education outreach by manufacturers to vocational schools, high schools, colleges and universities. Investing in training is another thing manufacturers must do if they want to close the manufacturing skills gap. Even before new workers come through the doors, manufacturers need to prepare them for success. For this, a series of “earn and learn” training programs have been developed. "Made in the USA” – Labor and material costs used to be lower overseas; but, things have changed. Besides rising labor costs all over the world, including China, U.S.-based manufacturers must pay increased prices for leaner supply chains and superior product quality. Considering that access to capital for U.S. manufacturers and consumer perception of quality and value are two factors positively influencing the supply and demand for U.S.-based goods, it is no wonder that more and more products wearing “Made in the USA” labels are manufactured. As a result, a number of manufacturing sectors, including Primary Metals, Fabricated Metal Products, Apparel, Leather and Allied Products, Furniture, Food, Beverage and Tobacco Products, Textile Mills, Transportation Equipment, Appliances and Components, Paper Products and Wood Products, have reported growth. To promote growth even more, the State of California has launched “Made in California” - a program that allows California manufacturers to use the State’s reputation to market their products. Do you want to find out more about manufacturing in California? If yes, we invite you to subscribe to our blog, which covers a wide variety of manufacturing topics.